My favorite photos from the trip can be found here. 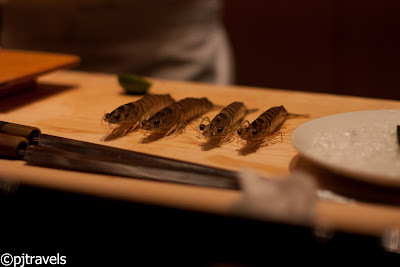 Our time in Tokyo felt action-packed, and we spent a lot of it eating. Everytime we saw (or smelt something tasty), we made sure to stop for a bite. This trip was a short sampling of Tokyo, but it was fun nonetheless. Ramen with pork belly. We saw this later, but we put money into a machine that printed a ticket of what we wanted. We then handed the ticket to the hostess. Of course it was tasty, it’s pork belly. Fresh purple potato waffle. Really good despite not sounding so. 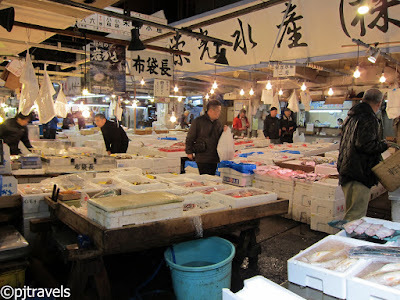 Some more sushi at the Tsujiki fish market. Tiny restaurant with 3 sushi chefs serving 10 people. Would have been the best sushi ever if not for the previous day. Reinforced my belief that you should just look for lines if you don’t have a firm recommendation on where to go. Also, it’s also pretty convenient if you’re by yourself – I skipped ahead in line since there was a spot for just one person. Build your own udon bowl. Once again, we looked for a crowded restaurant and got a pleasant surprise. Pick your tempura and then choose which soup/size you want for the udon. Food from convenience stores. You can get meals that are heated up in the microwave. Not the best nutritionally, but pretty good considering it’s from a 7-11 equivalent. Flaming Lips/Mew concert. Musically, I like Mew, but Flaming Lips put on a good show. Lots of balloons and confetti. Even better seeing folks in suits jamming out to the music. On the walk between the hotel and Shinjuku station, an eyeglass store had set out a station to clean eyeglasses. Great way to get folks to read/listen to your ads. Free tissue packets – hand out something useful so people take your advertisements. Rule abiding/demure folks. Bikes didn’t seem as locked up and everyone was careful to stand on the left of escalators and walk on the right. When you put it in this context, the Flaming Lips show is more interesting culturally. Timely trains and lots of good signs/maps in the stations and around tourist attractions. It depends on what you make of the situation. 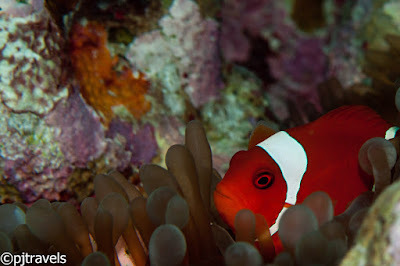 The dive team at Wakatobi asked us to submit six of our favorite shots from the week for a presentation. 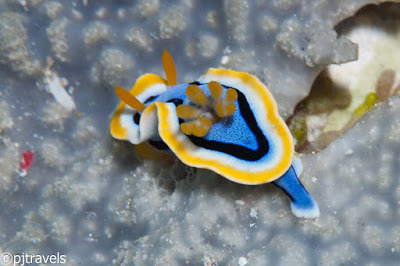 Two of the six were from night dives using the S90. 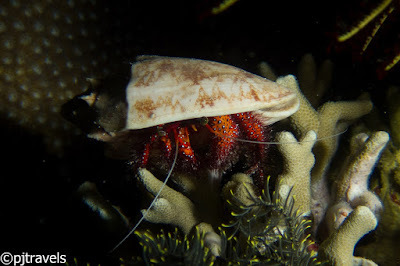 I’m too frazzled by night dives to use anything other than a point and shoot. I also like to use a flash light in one hand and the camera in another. The SLR (even without the housing) is just too big to do this. We only have one strobe for each camera, and both are on the left. Sometimes, I want to light the subject from the right. If I want the strobe far out enough, I have to go upside down. I’m not good enough a diver to balance the SLR and take the picture upside down. I’m a big believer in it’s the user and not the gear. This is particularly true in cycling and triathlon, and often in photography. Above water, we often don’t use the limits of the simple gear that we have. Unless I’m using a special lens, I couldn’t tell the difference between the S90 and the SLR in daily shots. 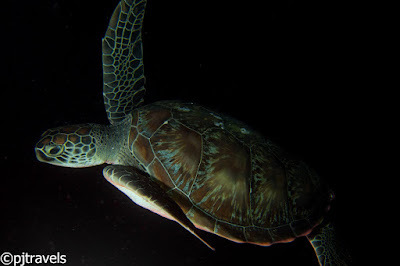 Underwater, there is a huge difference between the two. The speed and sharpness of the SLR+100mm lens makes the difference between in and out of focus. To keep thing’s interesting, I borrowed Ed’s fish eye lens to mount atop the S90 housing. The mount wasn’t made for this particular housing, so you’ll see some vignetting. I like the effect, so I kept it where possible. 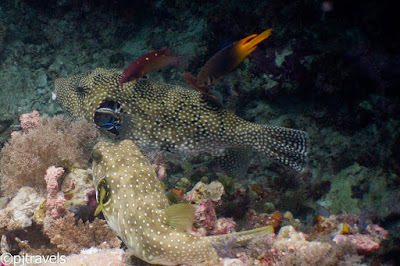 Pufferfish at a cleaning station. 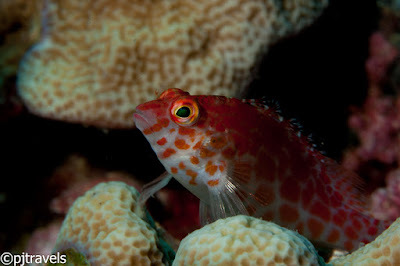 The cleaner fish are swimming through the mouth/gills of the puffer to remove parasites and other junk. When P was reviewing my photos and saw this tiny “thing,” he jokingly mentioned that I might have discovered a new species. I’m gullible and an optimist. 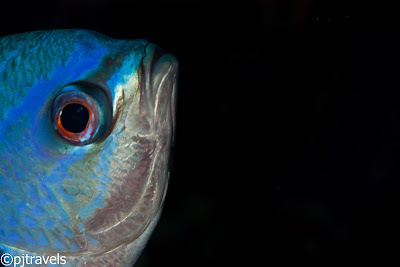 So, I spent a good bit of time reviewing the Fish ID book hoping the creature wasn’t in the book. 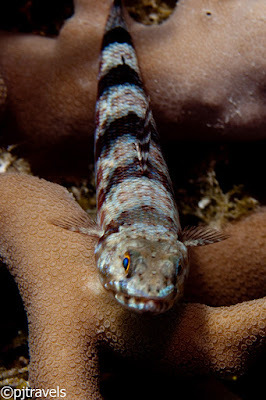 Alas, it’s a blackspotted triplefin. 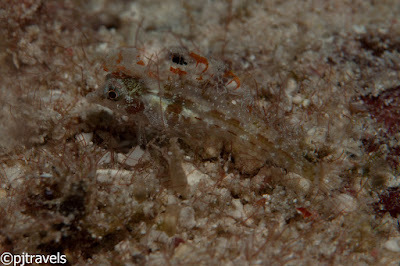 Not much of an artistic photo, but the creature was about 2-3 cm and blended in with the background. I had to look off the eyepiece a few times to make sure I was aiming the camera at the right place. I got the SLR again today and tried P’s advice. It’s amazing how one photo can make my day. 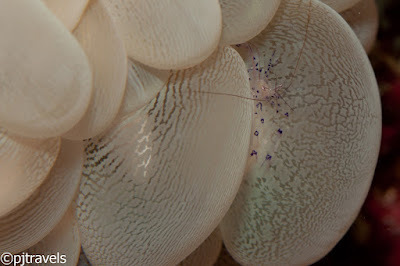 I’m never going to take good shots like P.
When I had these, I’d look away from the camera eyepiece and at the reef itself. The fish highways (a school of fish all swimming in the same direction) or the sheer number of fish reminded me that I’m pretty lucky to dive here. 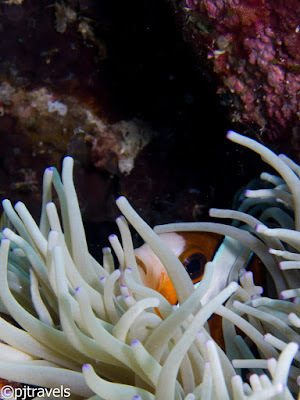 I finally calmed down during the last dive on the house reef, and I got my best shots there. 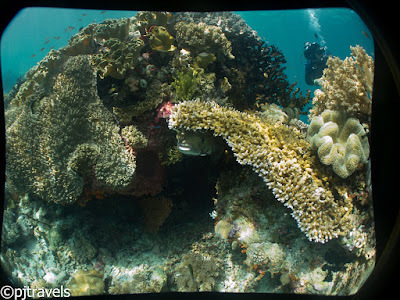 The house reef (reef where the resort is located) is the best I’ve seen. We traded cameras today, so I had the Canon S90 while P has the SLR. His pictures are amazing – he’s really good with lighting and developing. I’ll upload both sets of photos and share them when we have more bandwidth (the resort only has access via satellite, and I didn’t want to hog the bandwidth uploading massive pictures). Speaking of the resort – the service and logistics are amazing. For approximately 50 guests, there is a staff of 140+. We have constant electricity thanks to two generators and fresh water through a desalinization system. There are folks to feed us, clean after us, fill our tanks, do maintenance and generally take care of us during and after dives. Everything has worked so seamlessly that we didn’t realize what went into running such a remote operation until we took a tour of the resort. 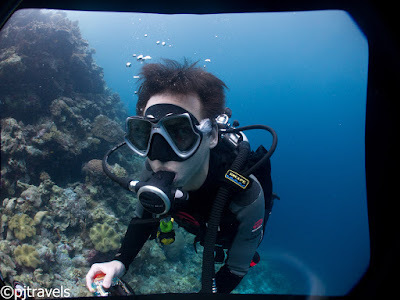 As far as the diving goes, I’m still blown away by the healthy coral (massive corals on each dive), abundance of fish (thanks to conservation efforts of the resort and the local population) and the clear water. 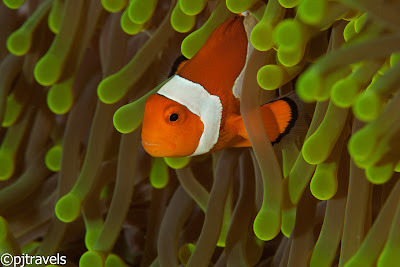 Wow – the lushness of underwater life here at Wakatobi is amazing. 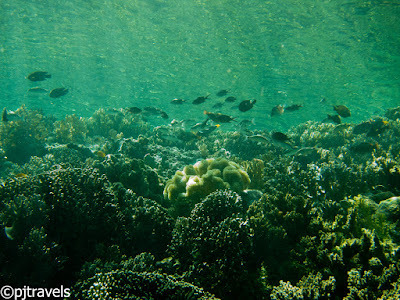 Great biodiversity, tons of fish, and vibrant coral. It was absolutely worth the long journey here. 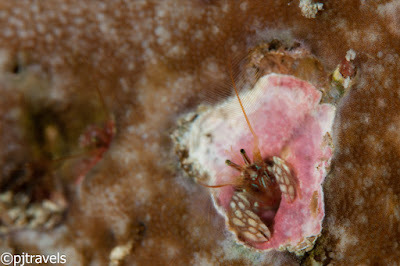 We got a new 100mm macro lens for the SLR, and today was my first day using it. At first, it felt unfair since I could get more detail further away from the subject. I no longer scare the fish since I don’t have to be as close. It’s a mixed blessing in that I can’t shoot anything bigger than a fist, and with SLRs, you’re committed to the lens when you jump in the water. That being said, it’s not the gear – it’s the user. I’ve forgotten how to use a strobe, so all my pictures have hot spots. 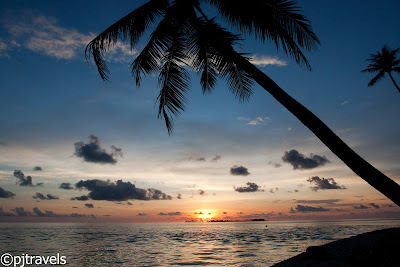 I didn’t realize how remote Wakatobi was until today. (Geography is not my strong suit.) It was two hours in a turbo prob, a stop to refuel (too much luggage from all the divers), and then another two hours. 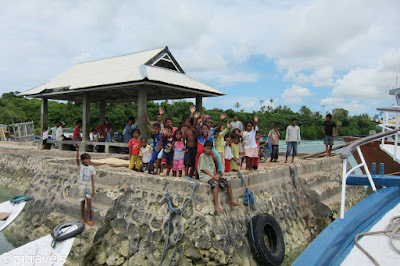 When we landed, we got into minivans and drove through the neighboring island to a ferry that took us to Wakatobi. When we drove through the island, we heard tons of kids eagerly wave “ah-lo” to us. It reminded me of the kids in Vietnam. We spent the rest of the day setting up gear (mainly the cameras) and relaxing. It’s amazing how quickly I decompress out here.